Comments: A 30 ft. waterfall into a half open cave. It's as if pixies and unicorns are going to come flying out of the forest. This is the most beautiful thing I have seen in Texas so far. A steep hike down to the pool and then a leisurely hike back to the river. Get there early as the park has a maximum on visitors and closes around 6pm. 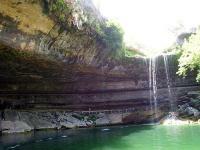 Nice day trip from Perdenales or Krausy Springs camping areas.